Every respectable tourist that comes to Vienna has to go to a café - ideally a traditional one. However, there are several hundred cafes in Vienna only, of which dozens meet even rigorous standards of traditionalism (whatever that might mean). For tourists, making a choice might be a bit difficult. To explain this video: There is a famous song on a streaker in Vienna's legendary "Cafe Hawelka". This young gent apparently lost a bet and gave it a shot - provoking old Mr Hawelka, the legend himself, to take action. Salute to the Nackerter im Hawelka! 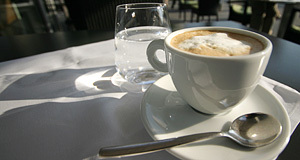 If you live in Vienna for a while, you might have a chance to experience a significant percentage of the city′s cafes. Otherwise, you will have to rely on recommendations. Essentially all guide books for Austria include a list with recommendable cafes at least for Vienna. I think that an extensive review doesn′t make much sense, because you won′t have a chance to go to more cafes than maybe a few. However, I think that it does make sense to name traditional cafes that are near popular sightseeing attractions - this way, the following guide might help you the schedule your trip and match it with a stop-over for a "Melange". I am quite proud of this "sightseeing-meets-coffee" approach and hope you appreciate this list. Note that it is anything but complete. I just tried to make it in way that is convenient for sightseers with an urge for caffeine - plus the cultural experience of a Viennese Café. Café Hawelka: One of Vienna′s most Bohemian cafes is actually run by actual Bohemians and a legend in Austria. Famous for Buchteln, a yeast-dessert. Smokey, filthy and always crowded with tourists and the odd local. Attractions nearby: Graben, Jewish Museum, Peterskirche, Stephansdom. Café Landtmann: A very exclusive café, popular with staff and audience of the Burgtheater. A popular place for making business over a cup of coffee, too. Address: Karl-Lueger-Ring 4 (next to Burgtheater). Attractions nearby: Burgtheater, Rathaus City Hall, Main University, Votivkirche, Minoritenkirche. Café Central: Located in an opulent neo-Renaissance building, the interiors of Café Central offer a great deal of Imperial splendour. Was popular with Vienna′s Fin de Siecle intelligentsia. Address: Herrengasse 14 (near Minoritenkirche). Attractions nearby: Minoritenkirche, Schottenstift Abbey, BA-CA Kunstforum, Am Hof Square, Hofburg. Café Griensteidl: Very classy, traditional café directly next to the Hofburg. Was one of the favourite places of Peter Altenberg, an Austrian impressionist writer. Today a bit touristy, tends to over-do the "traditional" thing a bit. Address: Michaelerplatz Square 2 (between Looshaus and Hofburg). Attractions nearby: Hofburg Palace, Michaelerkirche Church, Minoritenkirche, Kohlmarkt, Graben, Peterskirche. Café Alt Wien: Slightly hidden treasure for those who want the real deal. Scruffy, Bohemian place, smoky and dark, somewhat similar to the Hawelka - but with almost no tourists. Address: Bäckerstraße 9 (bit tricky to find). Attractions nearby: Jesuitenkirche Church, Alte Aula, Heiligenkreuzerhof, Stephansdom Cathedral. Cafe Sacher: Many tourists think that the Sacher is the mother of all Cafes in Austria - due to the famous Sacher Tart. In fact, the Sacher is indeed quite traditional, but very expensive, very touristy and a hotel café after all. Attractions nearby: Staatsoper, Kärntner Straße, Neuer Markt Square, Stephansdom Cathedral, Albertina, Hofburg, Academy of Fine Arts. Continue with "List of Viennese Cafes - Part II"